On January 15, 2019, Olivia let go of the hands of her earthly family and accepted the hand of Jesus. She knew her Lord as her Savior. Liviy was met by her husband, Curt, her parents Paul and Audrey and many close friends and family. She fought the good fight against her medical challenges with dignity and determination. She was the commander of her own ship until the end. Olivia (Liviy) Jean Nahrgang Bartelson was born to Paul and Audrey (Albert) Nahrgang in Winona, Minnesota, on March 29, 1944. 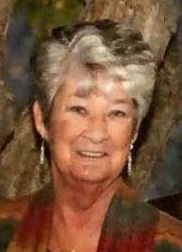 She was the oldest of their four children; her siblings are Paulette, Roger, and Carol. On March 30, 1961, she married Curtis Dean Bartelson, and they had 3 children, Scott, Brenda and Mark. Liviy's first playmates were her siblings. When Paulette arrived, Liviy had to wait a couple of years to be able to play with her. She then loved to dress Paulette up in doll clothes. Eventually, the barn cats were dressed up, but they would take off running with the dresses still on them. Roger was a very special brother to Liviy, and they shared a special bond that was like no other. Roger and his wife Mary moved to Arizona, and they lived across the street from each other. When she moved back to Minnesota, they talked daily on the phone. Carol, her youngest sister, was able to grow up with Liviy's children creating many memories. At times, Liviy felt like she had four children instead of three. Carol, a nurse, advocated for her care and often educated the family of the trials of her precarious diagnoses. Liviy created many life-long memories growing up on the farm. Special cousins gathered where they played and just enjoyed being around each other, and her cousins became her life-long friends. If you ask any of them, what happened at Uncle Paul and Auntie Audrey’s place, stays there! Her children were so special to Liviy. Liviy and Curt were blessed to have children that were some of the most rambunctious and sociable children you ever could meet, but she was up to the task of raising them. Liviy would try to discipline her children, but they were often able to get her to smirk when she was attempting to be stern. Liviy taught her children to be respectful and loving to everyone that they met. They were raised in the Christian faith and taught the gifts of living each day to its finest. She thoroughly loved being a Mom and cherished her children. They knew she loved them very much, and they will treasure her memories in the times to come. Liviy may be gone, but her children have so many memories to contemplate in their hearts that she will never be forgotten. Many great times were had by all in the company of great family at Liviy and Curt's home on Linden Street in Lewiston. Their home was as large as their hearts, and it was open to all. During the holidays they often hosted many huge family gatherings where they could sit everyone around the table. Curt was always the first one up to stoke the fire and then stuff the turkey. Liviy would get the rest of the meal going. They loved to have anyone that could be there, the more the merrier. When friends gathered for get-togethers, all had many laughs. Whether they were playing cards, gathering wood for heating their large home or enjoying a potluck, they found great joy in being around others. These gatherings of Liviy and Curt's friends produced many friendships for their children Scott, Brenda and Mark that continue to this day. Liviy and Curt lived in Minnesota before moving to Arizona in 1986, spending nineteen years in the desert. Although this was their second home, they cherished Arizona and loved everything it had to offer. They often liked to call those back in Minnesota to discuss the weather, especially in the winter during a cold snap. In Arizona, they found new friends and loved to continue the tradition of opening their home to everyone. Many of their Minnesota friends and family were able to come visit them from Minnesota. They loved to show them the beauty and allure of their new home in Arizona. After Curt passed away, Liviy moved back to Minnesota, but she left a part of heart there. Liviy was adored by her grandchildren, and she loved to spoil them with trips to the Mall of America when she would visit from Arizona in their younger years. She was so proud of each and every one of them. She showered them with love and loved to attend their life milestones. Liviy was a fashion trendsetter and she loved to add her own special flare to her outfits. She accessorized head-to-toe with sunglasses, her readers, jewelry, and socks. At times, nothing matched, but Liviy could pull it off. She took no fashion cues from anyone, but rather created her own. Her hobbies included photography, woodworking, rummage sales, painting, and gardening. Her gardens consisted of rocks that she would find from her travels, garden flags, and garden arts made up of things she would find on her adventures. She loved to travel and was lucky enough to have been to many states including Hawaii and Alaska, a cruise to the Bahamas, and to Canada and Mexico. Liviy's survivors include her children, Scott (Barb) Bartelson of Utica, Brenda (Philip) Rausch of Utica, and Mark (Debra) Bartelson of Kellogg. Liviy's grandchildren are Abby (Josh) Randall of Utica; Becky (Dennis) Mueller of Lewiston; Rachel Bartelson of Rochester; Haylee (Scott) Pagenkopf of Holmen, WI; Brady (Amanda) Bartelson of Lewiston; Taylor (special friend, Ashley) Bartelson West St. Paul; Erik Madison of Kellogg; and Whitney (fiancée, Juan) Madison of Austin, TX. Liviy loved her great-grandchildren. They are Hayden and Harper Randall of Utica; Ruben and Audrey Mueller of Lewiston; Khaleesi Pagenkopf of Holmen, WI; Nathan Curtis Bartelson and his sibling-to-be of Lewiston; and Weston and Grace Madison of Plainview. Liviy's siblings are Paulette (David) Karn of Odessa, MN; Roger (Mary) Nahrgang of Queen Creek, AZ; and Carol (Dennis) Asleson of Cannon Falls, MN. Nieces and nephews include John (Danielle) Karn, Jennifer (Cory) Waller, Lisa (fiancée, Manuel) Nahrgang, Tony Nahrgang, Jackie (Paul) Sczepanski, Kelly Asleson, Brittany Asleson, Craig (Anna) Asleson , LaVonne (Dave) Engle, Joel Finlayson Brian (Karen ) Finlayson, Darla Finlayson, Michelle Finlayson, Kim (Kathy) Bartelson, Kevin (Carrie) Bartelson, Kayla (Dave) Ritter, Keta (Mark) Lindstrom, Cary (Sue) Kronebusch and Linette (John) Alison. She is further survived by many great nieces and nephews. Liviy was preceded in death by her husband Curt, her parents Paul and Audrey Nahrgang, special cousins Rebecca Sickert, Freddy Altoff, and Susie Norman and her Godson, Kenny Finlayson. Visitation will be held from 1 PM until the funeral service at 3 PM on Sunday, January 20, 2019, at St. John's Evangelical Lutheran Church, 180 William Street in Lewiston, MN, with a luncheon and reception immediately following the service. Online condolences or memories may be left for Olivia’s family at www.watkowski-mulyck.com.